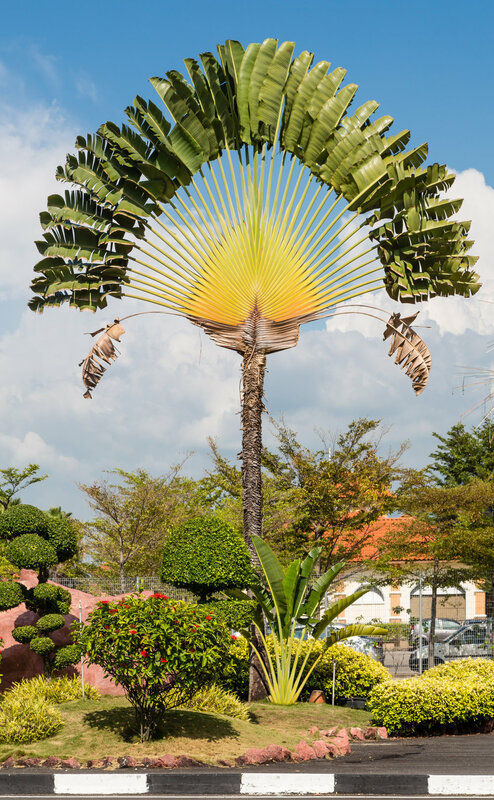 This nifty looking tree is commonly referred to as the traveler's palm (Ravenala madagascariensis). In reality, it is not a palm at all but rather a close cousin of the bird of paradise plants (Strelitziaceae). It is endemic to Madagascar and the only member of its genus. Even more fascinating is its relationship with another uniquely Madagascan group - the lemurs. But first we must ask, what's in a name? The name "traveler's palm" has two likely explanations. The first has to do with the orientation of that giant fan of leaves. The tree is said to align its photosynthetic fan in an east-west orientation, which can serve as a crude compass, allowing weary travelers to orient themselves. I found no data to support this. The other possibility comes from the fact that this tree collects a lot of water in its nooks and crannies. Each of its hollow leaf bases can hold upwards of a quart of rain water! Get to it quick, though, because these water stores soon stagnate. Flowers are produced between the axils of the leaves and closely resemble those of its bird of paradise cousins. Closer observation will reveal that they are nonetheless unique. For starters, they are large and contained within stout green bracts. Also, they are considerably less showy than the rest of the family. They don't produce any strong odors but they do fill up with copious amounts of sucrose-rich nectar. Finally, the flowers remain closed, even when mature and are amazingly sturdy structures. It may seem odd for a plant to guard its flowers so tightly until you consider how they are pollinated. It seems fitting that an endemic plant like the traveler's palm would enter into a pollination syndrome with another group of Madagascar endemics. As it turns out, lemurs seem to be the preferred pollinators of this species. Though black lemurs, white fronted lemurs, and greater dwarf lemurs have been recorded visiting these blooms, it appears that the black-and-white ruffed lemur manages a bulk of the pollination services for this plant. Watching the lemurs feed, one quickly understands why the flowers are so stout. Lemurs force open the blooms to get at the nectar inside. The long muzzles of the black-and-white ruffed lemur seem especially suited for accessing the energy-rich nectar within. The flowers themselves seem primed for such activity as well. The enclosed anthers are held under great tension. When a lemur pries apart the petals, the anthers spring forward and dust its muzzle with pollen. Using both its hands and feet, the lemur must wedge its face down into the nectar chamber in order to take a sip. In doing so, it inevitably comes into contact with the stigma. Thus, pollination is achieved. Once fertilized, the traveler's palm produces seeds that are covered in beautiful blue arils. All in all, this is one unique plant. Though its not the only plant to utilize lemurs as pollinators, it is nonetheless one of the more remarkable examples. Its stunning appearance has made it into something of a horticultural celebrity and one can usually find the traveler's palm growing in larger botanical gardens around the world. Though the traveler's palm itself is not endangered, its lemur pollinators certainly are. As I have said time and again, plants do not operate in a vacuum. To save a species, one must consider the entirety of its habitat. This is why land conservation is so vitally important. Support a land conservancy today! The world of seed dispersal strategies is fascinating. Since the survival of any plant species requires that its seed find a suitable place to germinate, it is no wonder then that there are myriad ways in which plants disseminate their propagules. Probably my favorite strategies to ponder are those involving diplochory. Diplochory is a fancy way of saying that seed dispersal involves two or more dispersal agents. Probably the most obvious to us are those that utilize fruit. For example, any time a bird eats a fruit and poops out the seeds elsewhere, diplochory has happened. Less familiar but equally as cool forms of diplochory involve insect vectors. We have discussed myrmecochory (ant dispersal) in the past as well as a unique form of dispersal in which seeds mimic animal dung and are dispersed by dung beetles. But what about other insects? Are there more forms of insect seed dispersal out there? Yes there are. In fact, a 2016 paper offers evidence of a completely overlooked form of insect seed dispersal in the rainforests of Brazil. The seed dispersers in this case are crickets. Yes, you read that correctly - crickets. Crickets have been largely ignored as potential seed dispersers. Most are omnivores that eat everything from leaves to seeds and even other insects. One report from New Zealand showed that a large species of cricket known as the King weta can disperse viable seeds in its poop after consuming fruits. However, this is largely thought to be incidental. Despite this, few plant folk have ever considered looking at this melodic group of insects... until now. The team who published the paper noticed some interesting behavior between crickets and seeds of plants in the family Marantaceae. Plants in this group attach a fleshy structure to their seeds called an aril. The function of this aril is to attract potential seed dispersers. By offering up seeds from various members of the family, the research team were able to demonstrate that seed dispersal by crickets in this region is quite common. Even more astounding, they found that at least six different species of cricket were involved in removing seeds from the study area. What's more, these crickets only ate the aril, leaving the seed behind. The question of whether this constitutes effective seed dispersal remains to be seen. Still, this research suggests some very interesting things regarding crickets as seed dispersal agents. Not only did the crickets in this study remove the same amount of seeds as ants, they also removed larger seeds and took them farther than any ant species. Since only the aril is consumed, such behavior can seriously benefit large-seeded plants. Also, whereas ant seed dispersal occurs largely during daylight hours, cricket dispersal occurs mostly at night, thus adding more resolution to the story of seed dispersal in these habitats. I am very interested to see if this sort of cricket/seed interaction happens elsewhere in the world.